Founded in 1947 by Luigi Caccia Dominioni, Ignazio Gardella and Corrado Corradi Dell’Acqua, Azucena has always been held in the highest esteem as an Italian brand, combining formal elegance, understated luxury and an aesthetical purity in its collections, all manufactured to the highest standard. Named after Azucena, the gypsy in the Italian opera Il Trovatore, the architects created this brand to bring together a number of collections to furnish buildings they had designed. At the same time they saw an opportunity to produce individual pieces as part of their series of furniture collections. This resulted in a range of iconic pieces - in particular the “Catilina” chair - recognisable for marrying different but very refined materials, reworked into traditional stylistic forms. B&B Italia acquired the historic brand, intending to preserve it as part of Italy’s rich heritage, and it is being relaunched in 2018 with a series of “modern classics” designed by the architect Luigi Caccia Dominioni from the late 1940s onwards. 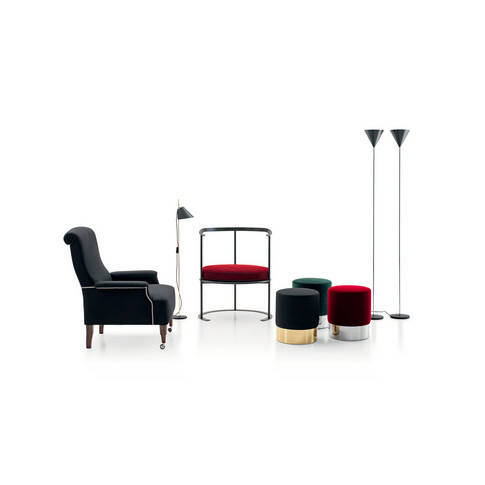 The collection includes chairs, sofas, tables and lamps that symbolise ‘made in Italy’ design and that return today as a showcase of style and quality.